Relate: This might come as a bit of a surprise to those who know me now but growing up I was a bit girl crazy. Most guys can remember about when they started realizing that girls didn’t have “cooties” after all. For me, they never did. I had a crush as far back as four, I was “married” to my “girlfriend” when I was in kindergarten. By second grade I started to diversify and in third grade I had a ranked list of nineteen girls that I liked. Pick a grade and I could tell you who I liked. Seriously. All the way up through high school my crushes lasted between 6 months to a year. Some turned into bonafide girlfriends but most did not and many would be surprised to know they made this list since I did such a good job of keeping it secret. The truth is, my heart was incredibly fickle. In many ways it still is. I don’t go through crushes like that anymore, but I do with favorite games, or movies, or TV shows, or… A new game comes out and for months, it is the best game ever developed. Then the next one comes along. Hero was the best TV show ever made… For a season. They butchered it even more with each successive season, and the reboot? Horrible. Then there was Prison Break… Ditto. Now I love Arrow, no Flash, no… When will my passion wane? The only thing that is certain is that sooner or later, it will. In all too many ways, my love simply does not last. Forever is not a concept my mind can really wrap itself around. I can try. In the abstract, I can grasp the concept a bit but there is nothing of reality for me to hold on to. Everything fades away. Even the heavens. Their age I can at least understand the numbers. Pretty much anything you read about our sun will tell you that our sun is about halfway through it’s cycle as a yellow star. (I blame the fact it is too often hiding behind clouds this April on a midlife crisis) In roughly five billion years, if physics is allowed to run its course, it will expand into a red giant. It’s descent into a white dwarf will then be relatively quick. That length of time will be measured in the hundreds of millions, or maybe only the tens of millions of years. Once it becomes a white dwarf it will take at least another dozen billion years before it will finally stop shining. The scary thing is that our sun is actually expected to outlive our galaxy. The Milky Way itself is headed at light speed towards disaster. In roughly four billion years it will collide with its nearest neighbor, Andromeda. Although we are believed to be far enough out to survive the collision, most of what is closer to the cores of both galaxies will explode in an cataclysm of celestial proportions. React: God’s unfailing love will last forever. 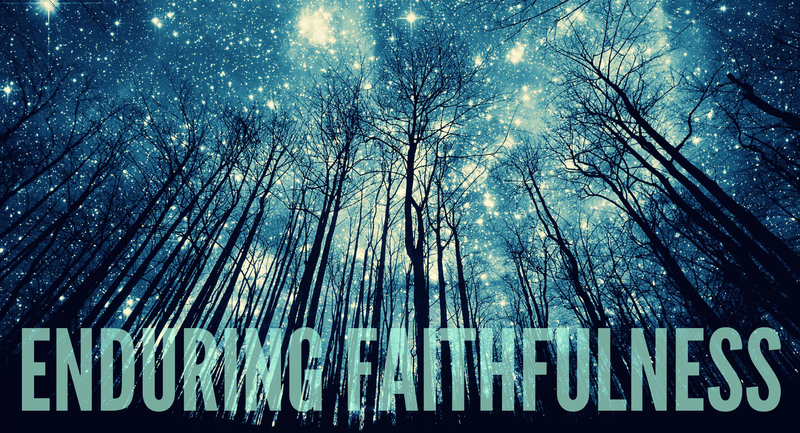 His faithfulness is as enduring as… the twenty five or so billion years that our sun will experience from birth to death. Actually, much more than that. Even though the “heavens” as we know it will have drastically changed, the “heavens” itself, the universe, will continue on. So will God’s faithfulness. Imagine that I have a child at forty, then that child has a child at forty. This continues down four a hundred million generations. Even though my great, great, great… grand-kids will be getting an unfathomably impressive light show every evening, God’s faithfulness will have remained unchanged. His love will be the same. Now that is truly mind blowing. I cannot begin to understand how enduring Your faithfulness and how unchanging Your love truly is. My mind cannot grasp it and all I can do is stand in amazement and bow my head in awe. All that I know has a beginning and an end. Everything I see fades with time. Except You. You alone are faithful, and loving, and worthy throughout all of time. So with every moment of the time I have here on earth, let me reflect that love back to You and help me to demonstrate Your faithfulness in my world. I cherish your insights BJ, you speak from the heart. Thank you as always. Worthy is the Lamb! Blessings! Man, I relate to this! We are constantly jumping from one great thing to the next. New music, new games and new movies! It will all fade, only one will remain unchanging. I love the part about the sun aging. It reminds me of “Indescribable” by Louie Giglio. Reblogged this on God Is Everything. I Own this Christian Song on CD and I love it!! God Bless All my Sisters and Brothers in Christ Jesus-Yeshua and Your Families and Friends! !